My first interaction with Book Creator was their iPad app. Our 1st graders used it each year for a small project. It was pretty cool, but it’s use was isolated to the iPads. It’s a wonderful app – we really did love it! But for it to be widely used, it was tough. We had one cart for the entire building. Fast forward a couple of years and Book Creator now has a web-based version … for Chrome … and it’s FREE!!! My district is lucky enough to be 1:1 with Chromebooks from 1st through 12th grade. Book Creator allows all of our students to let their creative juices flow in an e-book format and it’s great! 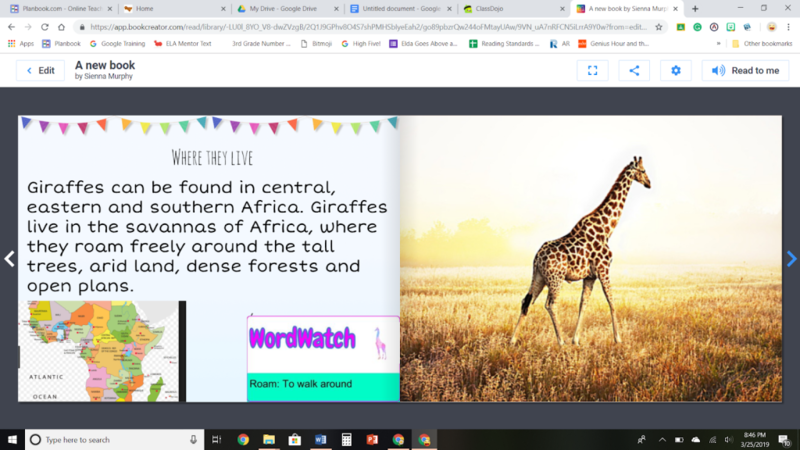 Book Creator also continues to be more and more robust offering additional features like an easier way to include images and allowing you to embed videos and other media. Recently, a 3rd grade teacher in one of my buildings asked me to help a few of her kiddos present their “passion projects”. Three of them wanted to make books. I showed them Book Creator and after about 45 minutes, they are well on their way to writing some pretty amazing books! To begin with Book Creator, we started off discussing the best layout for their topic — they had great questions — and were a little timid to make their selection! When we “presented” their cover and first 2 pages, they lit up! It feels a lot like a real book turning pages. I encouraged them to look at the mountains of books in their classroom to help them make any of the decisions they came across for their book. I loved the seriousness in their eyes when they evaluated whether or not to include an inside title page or not. Shortly before my time with them was up, I ‘teased’ the idea of including a video in their books … at first, disbelief, then excitement! Book Creator is a very user-friendly program and these 3rd graders were able to pick up on it quickly. I can’t say enough how rewarding it is to show students an idea, watch them make it their own, and then they dig in for more!!! From the very beginning, I could tell they were hooked! And I kept reminding them THEY are the authors so every decision is the right one 😊! Did I mention they are in 3rd grade??? literally packed with ideas for use in ANY/EVERY classroom! I look forward to continue this adventure with them and see what they create! I hope you enjoy seeing your students create as well! After graduating from The University of Dayton, Sarah taught 5th grade for 7 years, followed by 7 years in 7th & 8th grade Social Studies. Sarah is currently a Technology Integration Specialist for Ross Local Schools where she thoroughly enjoys supporting 2 elementaries of energetic teachers and students. She is also a Google for Education Certified Trainer and Educator, Levels 1 and 2. Want to find more activities and ideas using Chrome? Learn more about Google for Education’s Chromebook App Hub..coming soon!